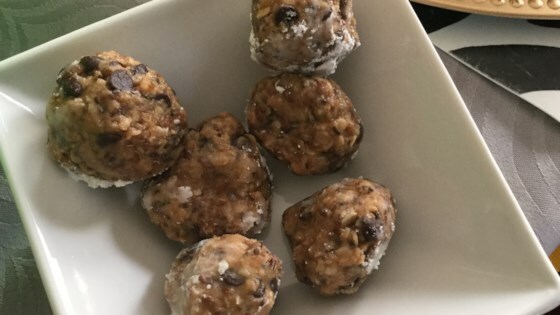 "Chia seed balls gives you a great healthy snack that is quick and easy. You can let these sit out overnight or just eat them immediately instead of refrigerating. You can use any combination of dried fruit. I use kitchen scissors to cut up the dried fruit." Stir oats, chia seeds, pepitas, pineapple, peanut butter, honey, coconut, mango, blueberries, flax, and wheat germ together in a large bowl; roll into 1-inch balls and refrigerate until set, about 1 hour. Very easy to make, I cut the recipe in half and still got 48 balls out of it. I used hemp hearts instead of wheat germ. Great for snacks!